Introduction: Students' learning approaches have a significant impact on the success of the educational experience, and a mismatch between instructional methods and the learning approach is very likely to create an obstacle to learning. Educational institutes' understanding of students' learning approaches allows those institutes to introduce changes in their curriculum content, instructional format, and assessment methods that will allow students to adopt deep learning techniques and critical thinking. The objective of this study was to determine and compare learning approaches among medical students following an interdisciplinary integrated curriculum. Methods: This was a cross-sectional study in which an electronic questionnaire using the Biggs two-factor Study Process Questionnaire (SPQ) with 20 questions was administered. Results: Of a total of 402 students at the medical school, 214 (53.2%) completed the questionnaire. There was a significant difference in the mean score of superficial approach, motive and strategy between students in the six medical school years. However, no significant difference was observed in the mean score of deep approach, motive and strategy. The mean score for years 1 and 2 showed a significantly higher surface approach, surface motive and surface strategy when compared with students in years 4-6 in medical school. Discussion: The superficial approach to learning was mostly preferred among first and second year medical students, and the least preferred among students in the final clinical years. These results may be useful in creating future teaching, learning and assessment strategies aiming to enhance a deep learning approach among medical students. Future studies are needed to investigate the reason for the preferred superficial approach among medical students in their early years of study. Both the student and the learning environment are sources of variables affecting learning approaches. Indeed, the approach to learning is only partly a function of a student's characteristics, since it can be modified by specific learning situations, such as the student's perception of the relevance of the learning task, the attitudes and enthusiasm of the lecturer, and the expected forms of assessment. Inappropriate assessment procedures and heavy workloads could have the unintended consequence of discouraging positive attitudes toward learning and encouraging SAs. This is of particular importance when students are recruited from different learning environments and diverse educational backgrounds, and have different expectations and evaluations of a given situation. In these circumstances, there is often a mismatch between instructional methods and learning approaches, and this mismatch will generally create an obstacle to learning. Within the literature, there are several models that assess and measure students' learning approaches and styles. Medical schools adopting an interdisciplinary integrated curriculum deliver clinically relevant education in basic sciences and a scientifically based education in clinical care. The aim is to provide an opportunity for a more relevant, less fragmented and stimulating experience for students. This is believed to promote active learning strategies, develop critical thinking and clinical problem-solving skills. Our medical school has adopted an integrated curriculum since its establishment in 1984. The curriculum is divided into a number of interdisciplinary blocks. Each block is organized according to body or organ systems. It is planned, coordinated and taught, by faculty from both basic science and clinical academic departments. In this context, the objective of this study was to determine and compare the learning approach measured by the two-factor SPQ among medical students participating in an interdisciplinary integrated curriculum. This was a cross-sectional study carried out at the Faculty of Medicine and Health Sciences (FMHS), United Arab Emirates University, Al Ain District, Abu Dhabi, United Arab Emirates University. The FMHS was opened in 1984 as the first federal medical school in the UAE. In 1986, the first class was admitted and graduated in 1993. Students are from both government-sponsored and private high schools. As mentioned, the medical school offers an interdisciplinary integrated curriculum. A - This item is never or only rarely true of me; B - This item is sometimes true of me; C - This item is true of me about half the time; D- This item is frequently true of me; E - This item is always or almost always true of me. Examples of statements to assess the DA were "I find that at times studying gives me a feeling of deep personal satisfaction" and "I find that I have to do enough work on a topic so that I can form my own conclusions before I am satisfied". Examples of statements assessing a superficial approach were "My aim is to pass the course while doing as little work as possible" and "I learn some things by rote, going over and over them until I know them by heart even if I do not understand them". Examples for the assessment of the students' motives for learning were "I feel that virtually any topic can be highly interesting once I get into it" and "I find I can get by in most assessments by memorizing key sections rather than trying to understand them". Finally, examples for assessing strategies for learning were "I test myself on important topics until I understand them completely" and "I find the best way to pass examinations is to try to remember answers to likely questions". The questionnaire was distributed both by e-mail and through hard copy to all students (years 1-6). Students were instructed to complete the questionnaire only once, either in the electronic or hard copy format. The objective of the study and the way to complete the questionnaire were explained to the students. Students were made aware that participation was voluntary; ethical approval was obtained from the Human Research Ethics Committee. Study duration was from September 18, 2011 to March 15, 2012. The total number of students registered at the FMHS during the study period was 402 students, with 283 (70.4%) female. All students at the FMHS are UAE nationals. A total of 214 (53.2%) students completed the questionnaire, with the response rate being highest among the students in clinical years 5 and 6. Students in clinical years demonstrated a significantly lower SA, motive and strategy than preclinical medical students. This was manly due to learning style differences between the female students in the two groups. There was no significant difference between the learning style of clinical and preclinical male students. 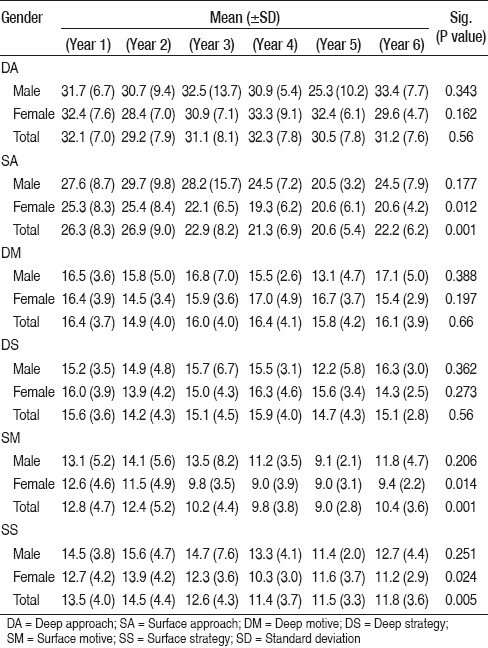 In contrast, female students in the clinical years demonstrated a significantly lower SA (P = 0.001), motive (0.001) and strategy (0.005) than preclinical female students [Table 1]. The objective of this study was to determine and compare the learning style measured by the two-factor SPQ among medical students who have participated in an integrated curriculum. We found significantly higher mean scores in SA, motive and strategy, among students in years 1 and 2 compared with the mean scores of students in the remaining four clinical years. Although Shankar et al. indicated that variation in learning style might be related to ethnic differences, our study suggests that this might not be a major factor as all students in our institute are UAE nationals. The observed higher SA score in the early years might suggest a carry-over from high school of a learning approach that is externally driven and involves memorization. The drop in the score of SA with time spent in medical school may reflect less reliance on a pattern of study that became recognized as less successful in the new learning environment. Differences in learning style between junior and senior medical students have been observed by other investigators. Newble and Gordon  reported that while medical students had high scores on SA in all years tested, first-year students had lower scores on a DA than did students in later years. These findings differ from our observations where scores on DA were higher than on SA in all years of study and did not change significantly in relation to year in school. The reduction in score for SA as training progressed may reflect an adaptation of study habits to the new learning environment, which emphasizes critical thinking. Another explanation might be due to differences in the format of teaching. During the first 2 years, lectures are the main method of delivery, whereas in the later years (3 and 4), teaching is mainly in the form of problem-based learning (PBL). Tiwaria et al. reported an increase in a deep learning approach with PBL, although other investigators have not observed similar changes with PBL. Indeed, Gurpinar et al. observed no change in students' learning approach associated with PBL. Further, Groves et al. reported a substantial shift toward a surface learning approach in a cohort of first-year medical students after completing their first year PBL curriculum. They argued that other factors, such as workload, may operate more as determinants of the learning approach than curriculum type. Therefore, it seems that the observed difference in learning approaches among students across the medical school years cannot be explained only by the difference in the teaching format. We observed that male students had a signifcantly higher orientation to a SA, motive and strategy compared with female medical students. Other investigators have found similar gender differences. Moreover, the reports in the literature on gender preferences with respect to teaching and learning approaches are also inconsistent. Wehrwein et al.,  for example, reported in a study involving junior and senior undergraduate students that male students preferred multimodal instruction, whereas female students favored single-mode instruction, with a preference toward kinesthetics. In contrast, Slater et al. reported that both male and female students preferred multiple modes of information presentation, and the numbers and types of modality combinations were not significantly different between genders. Overall, this was a cross-sectional questionnaire-based study that provided a snapshot of the learning styles of participating medical students. In terms of study limitations, the results might be specific to the group included in the study. Additionally, the study did not include demographic characteristics of students such as age group and residential background. In contrast, given that all students in the medical school are UAE nationals and enter medical school directly from high school, there likely were no significant variations in these characteristics. Another limitation is the variation in the response rate that was as low as 25% among year 1 students, potentially resulting in sampling bias. Finally, the fact that the study was extended for 6 months might have had some effect on the students' responses. However, the prolonged period was important for the study since it was necessary for first-year medical students to reflect on their learning in the new environment of medical school. The study has shown that a superficial approach to learning was mostly adopted among first and second year medical students, and was the less preferred strategy among students in the final clinical years. It is of concern that a DA to learning remained low among students throughout the 6 years. An interesting finding was the observed higher mean score of superficial learning among male compared with female students. Results suggest that learning styles among students are not similar throughout medical school. Medical schools need to take this into account when devising future teaching, learning and assessment strategies. The results of this study are important due to the limited number of published studies investigating learning style among medical students in the region. Collaborative research with other institutes where similar and different curricula are delivered might be of benefit. 1. Bollinger CL. The need for diversity in higher education. Acad Med 2003;78:431-6. 2. Divaris K, Barlow PJ, Chendea SA, Cheong WS, Dounis A, Dragan IF, et al. The academic environment: The students' perspective. Eur J Dent Educ 2008;12 Suppl 1:120-30. 3. Romanelli F, Bird E, Ryan M. Learning styles:A review of theory, application, and best practices. Am J Pharm Educ 2009;73:9. 4. Newble DI, Hejka EJ, Whelan G. The approaches to learning of specialist physicians. Med Educ 1990;24:101-9. 5. Curry L. Learning preferences in continuing medical education. Can Med Assoc J 1981;124:535-6. 6. Armstrong E, Parsa-Parsi R. How can physicians' learning styles drive educational planning? Acad Med 2005;80:680-4. 7. Beattie V, Collins B, McInnes B. Deep and surface learning: A simple or simplistic dichotomy? Account Educ 1997;6:1-12. 8. Reitmanova S. Cross-cultural undergraduate medical education in North America: Theoretical concepts and educational approaches. Teach Learn Med 2011;23:197-203. 9. Kassab S, Al-Shboul Q, Abu-Hijleh M, Hamdy H. Teaching styles of tutors in a problem-based curriculum: Students' and tutors' perception. Med Teach 2006;28:460-4. 10. Vermunt JD. Inventory of Learning Styles in Higher Education: Scoring key for the Inventory of Learning Styles in Higher Education Tilburg: Tilburg University; 1994. 11. Boyle EA, Duffy T, Dunleavy K. Learning styles and academic outcome: The validity and utility of Vermunt's Inventory of Learning Styles in a British higher education setting. Br J Educ Psychol 2003;73:267-90. 12. Kolb DA. Experiential learning: Experience as the source of learning and development. New Jersey: Prentice Hall; 1984. 13. Tennant M. Psychology and Adult Learning. 2 nd ed., London: Routledge; 1997. 14. Coffield F, Moseley D, Hall E, Ecclestone K. Learning styles and pedagogy in post-16 learning. A systematic and critical review. London: Learning and Skills Research Centre; 2004. 15. Biggs J, Kember D, Leung DY. The revised two-factor Study Process Questionnaire: R-SPQ-2F. Br J Educ Psychol 2001;71:133-49. 16. Walsh LJ, Seymour GJ. Dental education in Queensland: II. Principles of curriculum design. SADJ 2001;56:140-6. 17. Biggs JB. Student approaches to learning and studying. Melbourne: Australian Council for Educational Research; 1987. 18. Shankar PR, Dubey AK, Binu VS, Subish P, Deshpande VY. Learning styles of preclinical students in a medical college in western Nepal. Kathmandu Univ Med J (KUMJ) 2006;4:390-5. 19. Newble DI, Gordon MI. The learning style of medical students. Med Educ 1985;19:3-8. 20. Tiwaria A, Chan S, Wong E, Wong D, Chui C, Wong A, et al. The effect of problem-based learning on students' approaches to learning in the context of clinical nursing education. Nurse Educ Today 2006;26:430-8. 21. Gurpinar E, Bati H, Tetik C. Learning styles of medical students change in relation to time. Adv Physiol Educ 2011;35:307-11. 22. Groves M. Problem-based learning and learning approach: Is there a relationship? Adv Health Sci Educ Theory Pract 2005;10:315-26. 23. Wehrwein EA, Lujan HL, DiCarlo SE. Gender differences in learning style preferences among undergraduate physiology students. Adv Physiol Educ 2007;31:153-7. 24. Slater JA, Lujan HL, DiCarlo SE. Does gender influence learning style preferences of first-year medical students? Adv Physiol Educ 2007;31:336-42. 25. Jones R, Pitt N. Health surveys in the workplace: Comparison of postal, email and World Wide Web methods. Occup Med (Lond) 1999;49:556-8. 26. Joinson A. Social desirability, anonymity, and Internet-based questionnaires. Behav Res Methods Instrum Comput 1999;31:433-8. 27. Hunt N, McHale S. A practical guide to the e-mail interview. Qual Health Res 2007;17:1415-21. 28. Kinnula S, Renko M, Tapiainen T, Pokka T, Uhari M. Post-discharge follow-up of hospital-associated infections in paediatric patients with conventional questionnaires and electronic surveillance. J Hosp Infect 2012;80:13-6. 29. Zuidgeest M, Hendriks M, Koopman L, Spreeuwenberg P, Rademakers J. A comparison of a postal survey and mixed-mode survey using a questionnaire on patients' experiences with breast care. J Med Internet Res 2011;13:e68.